The following summary of water quantity and quality challenges within the Integrated Vaal River System is submitted on behalf of the Federation for Sustainable Environment (FSE). Summary of a talk given to the Mpumalanga Trout Association AGM on 7th February 2019. Working out what government is going to do regarding aquaculture and, or anything else for that matter requires one to look beyond government policy documents and the promises of politicians and officials. One must also consider the decisions taken by the ANC at its national conferences and the present and future alignment of forces within the ANC that gave rise to those decisions. Outdoor Fly Fishing Festival (OFF) at the Cradle Moon Conservancy, Muldersdrift, Gauteng on 2 & 3 Feb.
Set on the banks of the Cradle Moon Lodge Lake, the Outdoor Fishing Festival is a festival not to be missed! It is the inaugural year for the festival bringing fishermen together from all over the country. Illegal coal mining at the head of the Elands River in the Belfast/ Dullstroom district. FOSAF's court application is underway. Mario Cesare, chief warden of the Olifants River Game Reserve in Limpopo, and author of three best-selling books on game ranging and conservation – his latest is Heart of a Game Ranger: Stories from a Wild Life – is also a passionately keen fly fisherman. Here he takes up the cudgels (purist fly fishers would say ‘takes up the priests’) on behalf of what many anglers believe is the noblest fish of all, the trout. SAVE is disappointed with the pace of the Gauteng Premier’s intervention in the affairs of the Emfuleni Local Municipality (ELM). Click HERE to view another letter to the DWS Minister. Vaal pollution: Open letter to DWS Minister dated 12/08/2018. In 2002 South Africa officially became a water-constrained economy, when the National Water Resource Strategy reported that we had allocated 98% of our total water resource. Subsequent high confidence studies have shown that we over-estimated the water available at the time, so, in short, we have allocated all the water that we have. Ed Herbst on the likely consequences of efforts to declare the fish an invasive species. Click here to read the letter of demand. Click here to read the comments. Trout SA presentation on the Aquaculture Bill: update by Ilan Lax 9 Feb 2018. Trout in Mpumalanga: Update by Ilan Lax 9 Feb 2018. Draft NEMBA Bill for discussion & review purposes - January 2018. The world, in recent decades, has witnessed an incalculable surge in global "wicked" policy problems that have long-term, and most often irreversible, impacts, not least terrorism, climate change, biodiversity losses and desertification. Wicked problems are wicked because there is no single epistemological system that can adequately coordinate policy action for addressing them. Literature abounds with international case studies of opposition to national institutions that are designed to put into effect global and regional policies for resolving wicked problems. This raises questions about what constitutes reasonable institutions, how such institutions can be designed and why societies sometimes fail to develop such institutions despite the obvious need for them. Legislative control of the aquaculture industry in South Africa is so restrictive that it impedes any development. Fisheries scientist Dr Leon Barkhuizen gives us the first comprehensive record of the occurrence, distribution and population structure of smallmouth yellowfish at dams in the Free State province. World Fisheries Day is celebrated every year on the 21st of November throughout the world by fishing communities, conservation authorities, government departments, academia, research organization, NGO’s and general public. The Chairman Brian Clark requested that Ilan Lax, FOSAF National chairman, give a summary for those not familiar with the ongoing NEMBA saga. Ilan then gave a background briefing on what FOSAF’s are regarding NEMBA and the regulation of trout. Although the tourism sector has greater potential for job creation than the mining sector, the debate on which sector may be more sustainable for employment and local social development, has not been extensively researched, especially in the global South. The popular tourist destination of Dullstroom, Mpumalanga has come under threat from an increase in the number of mining applications for coal (and diamonds). Click here to view the presentation by Ilan Lax. With our rapidly expanding population and other global challenges comes increased stress on our natural ecosystems and biodiversity. This is especially true for freshwater ecosystems in Africa where pressures on freshwater resources are expected to intensify exponentially in upcoming decades. To make informed policy and management decisions about how to protect our freshwater biodiversity, we need data. That's where you come in. Powered by you, the citizen scientists, FishMAP is now collecting freshwater fish records from across Africa so that we can update species distribution records and fill in distribution gaps - information that is invaluable when it comes to conserving our freshwater fishes and their aquatic habitats. These are exciting times as never before has the potential contribution of citizen scientists to freshwater conservation in Africa been so great. Nature is the silent giver that brings us so much joy, and here is a chance for us to give back! 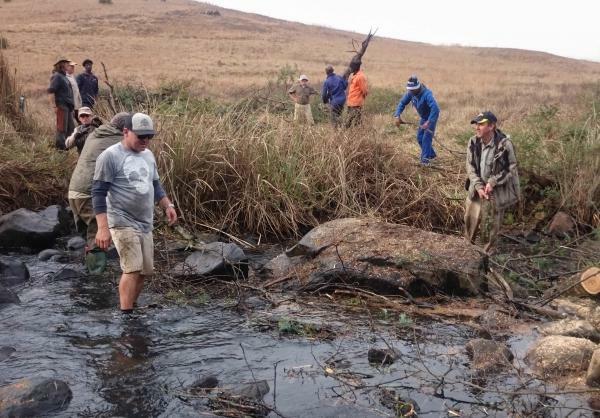 The Natal Fly Fishers Club held its third clean-up day on the Upper Umgeni River on Saturday 12th September. Unlike previous clean-up days the club hired in professional tree fellers to join the party of volunteers, and farmer Russell Watson, provided no less than four tractors to assist. With this considerable man and machine power, a highly successful and satisfying day was had. As reported last year FOSAF became aware that the Department of Environmental Affairs (“DEA”) was intent on pressing ahead with the implementation of a regulations framework that we were led to understand (on what little we at that stage could ascertain) was entirely different from that which we had commented and worked so hard on in the past. Mining right for open cast coal mine granted in Dullstroom area. The news that the WPB Colliery had been granted a mining right was greeted with shock by the SEI (Steenkampsberg Environmental Initiative) which is a coalition of FOSAF and major environmental NGO’s. Nearby landowners including the many flyfishing venues in the area were equally appalled. This is a great resource for all landowners, NGO's and the public in general who are confronted with problems from mining, particularly from those companies suspected of following incorrect procedures. "Essential Fly Tying Techiques" by Tim Rolston is an electronic book, the likes of which has never before been seen. In September 2011 we can expect a surge of new applications to prospect or even mine in the Steenkampsberg which is the heart of the province's famous Trout Triangle. NEM:BA mapping: Category 2 alien fish species. The final EIA Report dated April 2009 has been published.